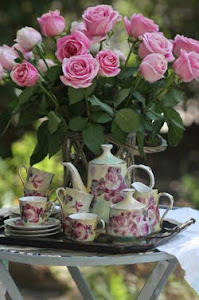 Our friend Anita over at Cedar Hill Ranch is giving away a gorgeous hand-painted coffee/tea set. Go by and visit her wonderful blog. We are partying with Sherry over at No Minimalist Here. 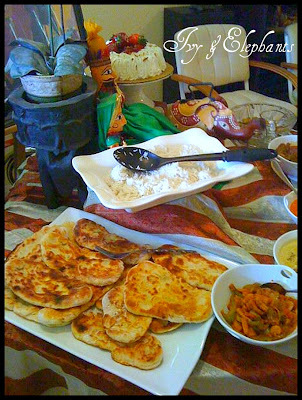 I am bringing to the party some of my most favorite Indian dishes. Please come join me. 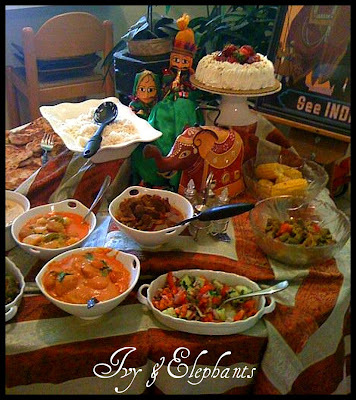 One of my favorite cuisines is Indian cuisine. 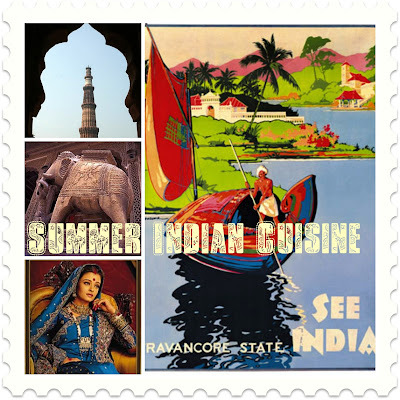 The smells, flavors, colors, textures, and of course tastes reminds me of an exotic summer. I find the use of various fresh spices, herbs, vegetables, and sometimes fruits to be absolutely intriguing. I usually cook Indian dishes on the weekends for my husband because I have more time to dedicate to such intricate dishes. 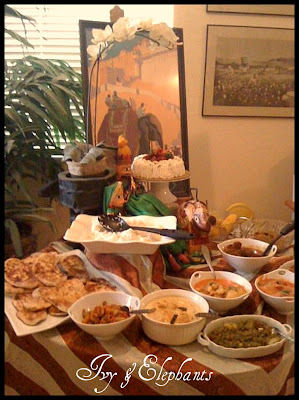 However, every summer the entire family, asks me to put on a major spread of all of our favorite Indian dishes. 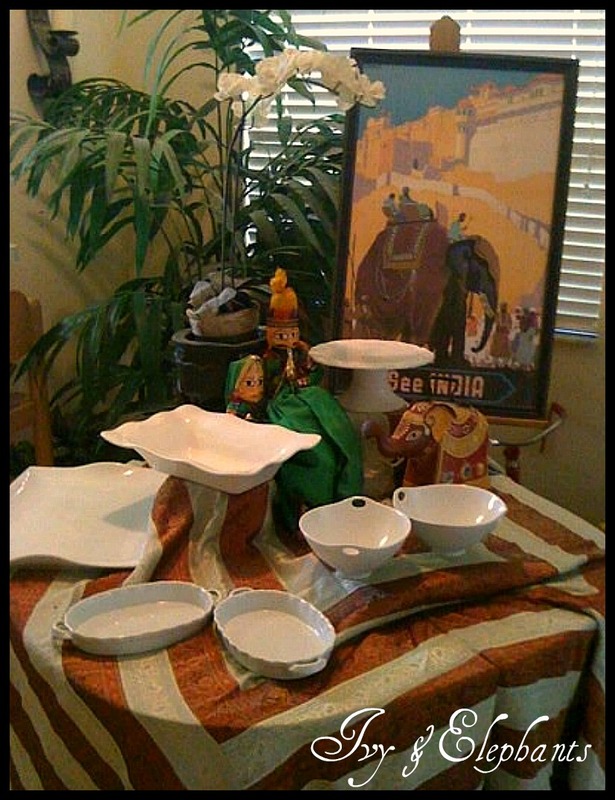 I set these dishes out in preparation for the homemade chutneys I created. The dishes are set out on a beautiful coverlet made from vintage saris. 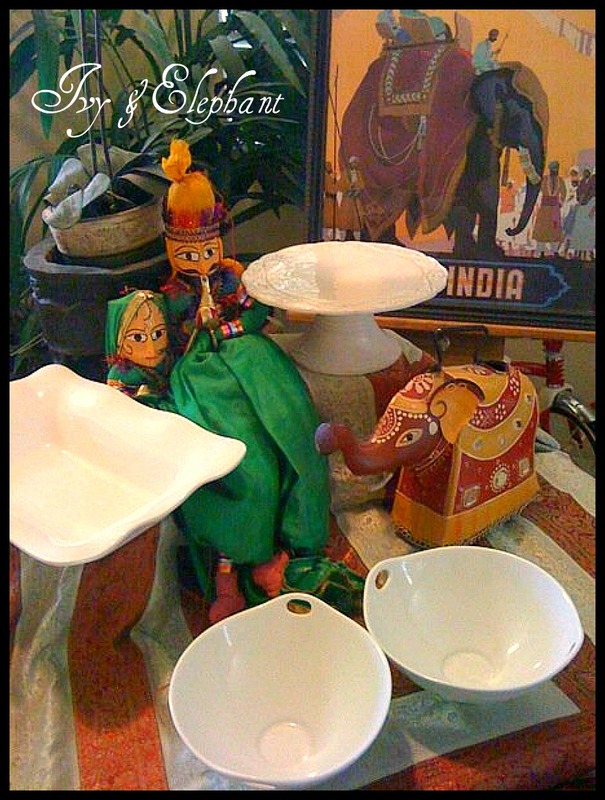 In between the dishes is one of my favorite finds from an import antique store. I just love his turban. India is also known for its assortment of rich colorful textiles. I use them to adorn many a tablescape. In addition to the beautifully embroidered coverlet, I add vintage artifacts that I have collected through the years. I love to collect vintage Indian marionette dolls. They are usually a couple. One trick that I use in the tablescape is to vary the height of objects to add more interest. I grabbed a few books from the bookshelf and placed them under the cloth and voila! Now the bowls and plates are ready to receive the delicious food. Thanks to Amazon for supplying me with a variety of wonderful cookbooks, I was able to prepare these family favs. 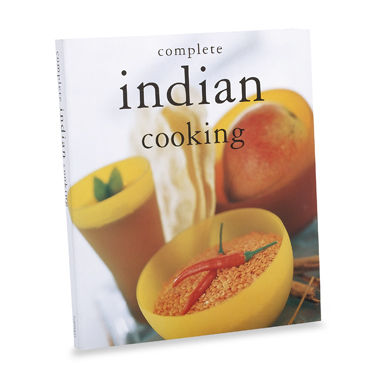 The majority of the recipes come from the book Complete Indian Cooking. Now you see why I only do this spread but once a year. It takes a year to digest all that great food. :-) I hope you enjoyed our favorite summer spread. Thank you so much for stopping by! Show some love and leave us your thoughtful comments! Thank you Sherry for hosting this wonderful summer blog party! Wow, you really go all out for the family. The dishes look delicious. The colors are beautiful and your table setting is the bomb. Love it all. Thanks for sharing. Very nice to meet you all. 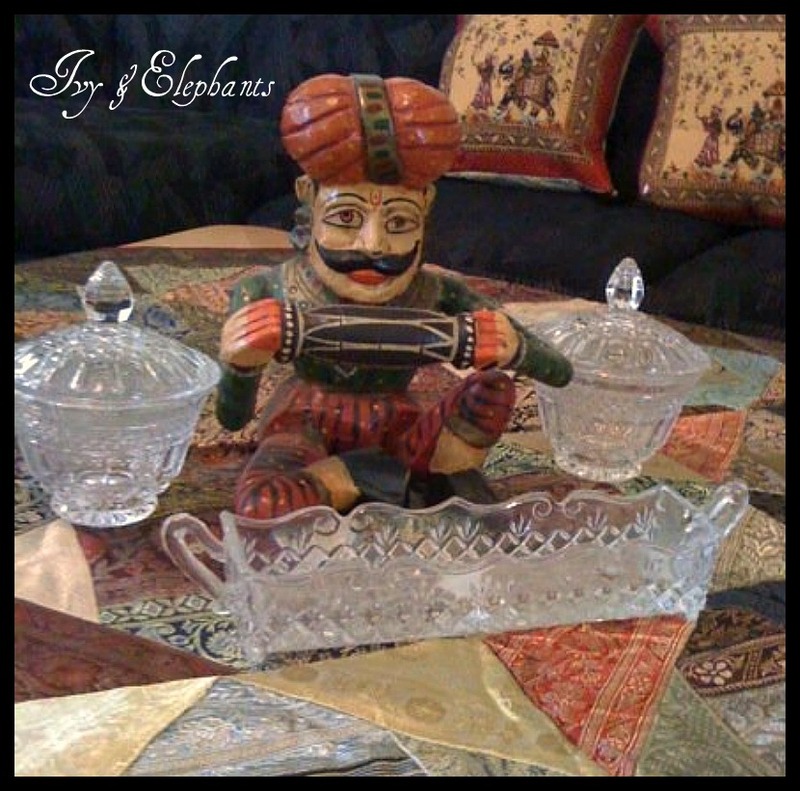 I love the way you use old silver plate and I am enchanted by the embellished bottles you did on your first post. I so want to try and make some as beautiful as yours. Thank you too for giving us a peek into Indian cuisine and you for stopping by and saying Hello on my blog. I will be following. Your food looks delicious! I am over visiting from Rosemary's Villabarnes! and I'm your newest follower! What time is dinner??? That looks fabulous! I love Indian food. Looking forward to browsing your blog. Wow, that is some feast! My mouth is watering just reading about it. :). I'm sure your family enjoyed it immensely! You have such a beautiful blog!! I LOVE your header so unique and pretty. Great Job. I will be looking into the book you said you got the inspiration from. Thank you for sharing it. I adore Indian food. I am a happy new follower. Your table and food look divine! Would really like to be at your place for this festive treat. I have just happily become your follower! Your menu sounds and looks delicious...I can't believe that you cooked all of that! Wow! PS: Thanks for visiting my blog and leaving a note...hope to see you more often. Oh my goodness Paula! My mouth is watering at the thought of those fabulous dishes. They all look so good! I am a serious lover of Indian food! Thank you for sharing it at the Summer Block Party! Paula, What a pretty table and the food looks delicious. I also love the butter chicken and flat bread though I have never tried to cook these myself. Thanks for joining the Summer Entertainment party and have a wonderful weekend. Oh I do love Indian Cuisine but am not very brave to try making it myself for some reason! I might just have to find that book to help me along! The collection of vintage artifacts are very beautiful. I also collected it on my India tour. What a feast - can I get an invite for the next one. It all looks delicious and beautifully presented. Thank you for you visit, I'm a new follower and will be back again soon. Oh, your summer spread looks fabulous! So pretty displayed on the vintage saris. You have created a lovely table with great attention to detail. Your menu sound amazing and it's pretty the colorful display you created, Paula! I too adore Indian food!! the Jamaican Gunga Pea soup. Congratulations on this very successful blog, I just love it! This looks amazing and delicious! I love the presentation as well! I am glad you stopped by, now I know about your wonderful blog. Your summer spread looks fabulous and great. So pretty displayed on the vintage saris. You have created a very attractive table with great attention to detail. Hi, Paula! This is my first visit to your blog. I haven't seen you before on BNOTP. I always try to visit every single blog, so I don't know how I missed you. I've been on a 2-month hiatus and just returned this week, so perhaps that's the answer. At any rate, glad to have found you now! What an incredible spread!!! You must have been in that kitchen for days!!! I am sure your family appreciates all the effort and love you put into making that very special dinner for them. I don't eat a lot of Indian food (don't know why...I love the spices! ), but it looks fantastic. Have a wonderful, cool (!!!) weekend! OH I love Indian food also! Your dinner sounds like a real event and I can see why everyone looks forward to it! My daughter is in India right now studying and she's bringing me back some scarves, saris and fabrics because she knows how much I love the colors and textures of their cloth!